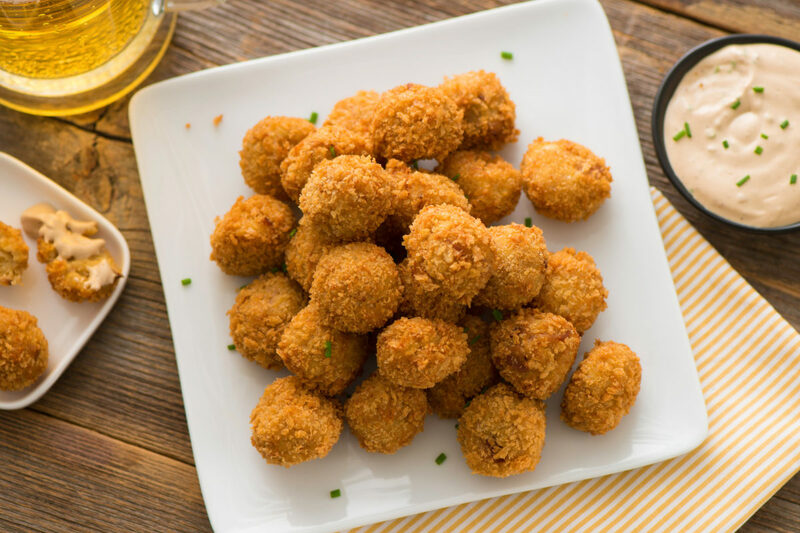 Loaded with yummy bacon and Cheddar, these addictively delicious crispy potato fritters are served with a cool and creamy chive sauce for dipping. Chive Dipping Sauce: Stir together sour cream, mayonnaise, chives, beef base, mustard, garlic and pepper. Refrigerate until ready to serve. Potato Fritters: Cook potatoes in large pot of boiling salted water for 15 to 20 minutes or until tender; drain well. Mash together potatoes, cream, butter and beef base until blended. Stir in eggs, cheese and bacon. Roll into 1-inch balls, then roll in bread crumbs to coat. Pour enough canola oil into large saucepan to come 2 inches up side; heat over medium heat until instant-read thermometer reads 350°F. Working in 4 batches, carefully drop fritters into hot oil and fry, turning once, for 2 to 3 minutes or until golden brown all over. Using slotted spoon, transfer fritters to paper towel–lined tray. Serve with Chive Dipping Sauce. Tip: Load up the fritters with jalapeños, fresh herbs, and/or cooked and chopped broccoli if desired.